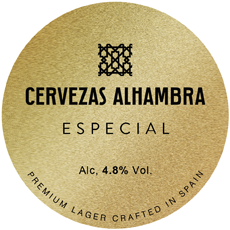 Alhambra brewery was founded in Granada in 1925 and is named after the city’s magnificent Alhambra Palace. The brewery was at that time situated on the outskirts of town not far from the foot of the snow-capped Sierra Nevada Mountains, the source of Spain’s finest water. Alhambra continues to brew with the best available ingredients and uses no additives. This is evident in the premium Reserva 1925 – named after the year of the brewery’s foundation and first brewed in 1997, inspired by the first recipes. The iconic bottle (awarded both Gold and overall ‘best in show’ for packaging in the 2015 International Beer Challenge) is based on the original design – green glass in Spain was very rare in those days! Reserva certainly lives up to its “Crafted Inside & Out” tag-line. The finest ingredients are used: Nugget, magnum and Taurus hops for bittering, Saaz for aroma; a specific yeast strain pitched fresh in every batch, and crystal clear water. It is brewed and conditioned over a lengthy 35 days to impart the maximum of flavour and smoothness.